Studio Rack Cabinet; 8U 15.5" deep. 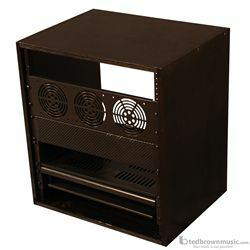 19" Studio rack cabinet with 5/8" thick MDF furniture grade black oak laminate. Rack rails constructed of 3.2mm heavy duty cold rolled steel.